BARREL HORSE FIT - Caldwell Saddle Co. In addition to the information below, we have a video that discusses saddle pads and saddle trees, and can be watched here. 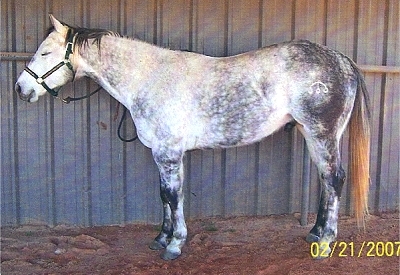 First: Thoroughbred type with an oval barrel, deeper than wide but often with large bulges at the top of shoulders and what is typically called “high withers”. (For proper understanding I will need to discuss this in detail in a moment). And second: performance Quarter type, round barreled often shorter and thicker with more muscling in the width of their backs, lower withers and flatter back. These two types can hardly ever share the same type pads or saddles. Even though the second type is less frequent in running horses, I will discuss these first. 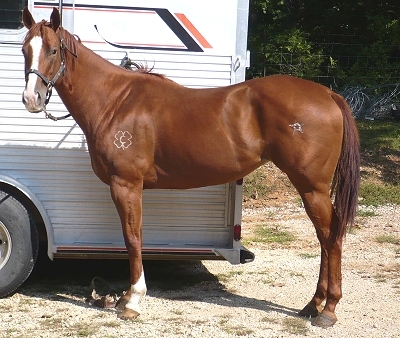 Quarter Type: These horses have generally a “normal” back, low rounded withers, slight dip in the low of the back running only nominal up hill to loin. Looking down on their back from up above, the back will be wide, full at the hips with only a small dip at his side before widening again to muscular shoulders getting fuller towards the lower shoulders. And often, if the animal is cutting bred, a strong loin will be present. This is indicated by a long bulge between the back and the top of the hip; very visible in a side view. 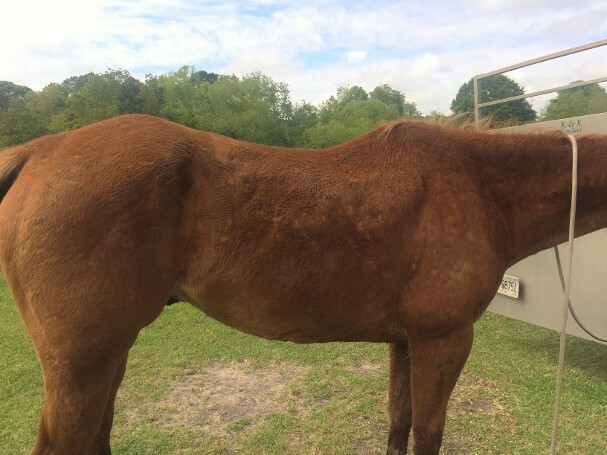 The muscle that caused this is not even able to be seen in a horse that runs straight ahead (as does a Thoroughbred) and stops by a “jogdown”. Muscle build up is formed by fast, sudden stops where the hindquarters and rear legs are tucked up and under the barrel. 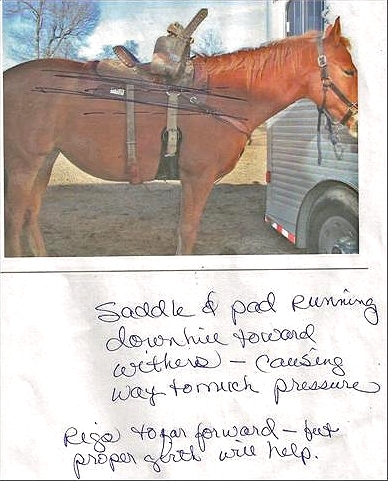 Genetics can be formed to pass this trait forward even without the training and usage; such as reining and cutting. Even a properly fitted saddle can pop up in the rear if this area is overly large or if the under side of the rear section of the saddle tree bar is not thinned or hollowed out enough to allow for this. Generally, the 1” thick 100% wool felt pad is best overall for density, absorbing sweat, durability, and fit. These come in contoured spine and straight cut, some with holes and/ or ovals cut into the spine. When a full straight cut felt is used a few times, the heat of a horse back will shape these to the horse. However, most animals have more contour to their backs nowadays, therefore all appear to benefit from shaped or contour of the spine area on the pads. My favorite is the contoured spine with a small oval cut out in front of the contour. These break in a little faster and the oval allows the rear portion of the withers to protrude through to give close contact saddles a low fit with out rubbing on top of that area which would happen if a layer of felt were laid between the bottom of the center of the saddle and the ridge of the rear of the withers. Before you get upset with my placing a heavy pad on a thickly muscled horse, let’s talk about density. All wools are not created equal and some are blends mixed with lesser products such as nylon or polyester, some even mix in floor sweepings. That is why there is such a price difference aside from labor. They are too hard to mold nicely to the horse’s back. Proper wool will have some give in the area under the front bars of the saddle when compressed. Compression can be checked by pressing the pad between your thumbs in the area under the front bar of the saddle since this is the area of the back where the saddle and rider will create the most pressure. Checking this will also keep you from falling into the habit of using the same pad for so many years that it loses its thickness by being flattened by the rider and saddles weight, while the edge, because there has been no wear there, stays full. By guess“i”mate, see how much actual “pad” is between your thumbs. This is how much real protection that there is between your weight and your saddle’s weight and your horses’ softer muscle tissue. This is usually 5/8” to ¾” in a good pad. 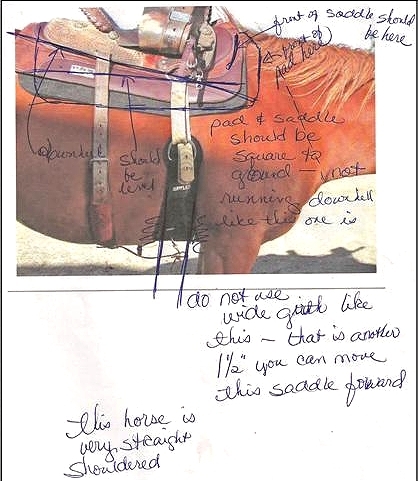 This test will cause several popular pads styles to fail; such as gels and airs that shift sideways allowing pressure points in the hard underside of a saddle that can hurt your horse. Materials other than those which are natural are never recommended. Only natural fibers like wool or hair will wick sweat and allow heat to dissipate. As previously mentioned, some pads have nylon, rubberized neoprene, and artificial fleece (which is made of polyester) against the horses hide and none of these should be accepted even if they are “easier” to clean. Pads that have rubber or foam between layers of felt are O.K. All the material and density factors apply to each type of horse, but shape vary in the extreme. Most people that think that they have to have a thin pad. This is because their saddles are too narrow in the tree to fit with a correct amount of padding. So, I do understand why folks are compensating with these but don’t believe for a moment that this is best for your horse. Almost exclusively these have “high withers” right? Wrong!! They “look” as if they have high withers, but this is an optical illusion. These animals have straight shoulders and as the top of the shoulder blade rotate forward, to create this straight shoulder, the wither area doubled in length and the rear part of the wither drops creating a low back. Don’t have a fit cause I just called your fast horse straight shouldered and low backed. Guess what? This conformation comes with speed! Perfect conformation does not always come with a 45 degree shoulder angle. Over the last several years, I have fit running horses with angles up to 80 degrees. The 45 degree shoulder causes a slower stride. Great for the pleasure riders but not for running barrels. For horses with this extreme shape in their backs fit is difficult. No wonder folks can’t pad or saddle their animals. 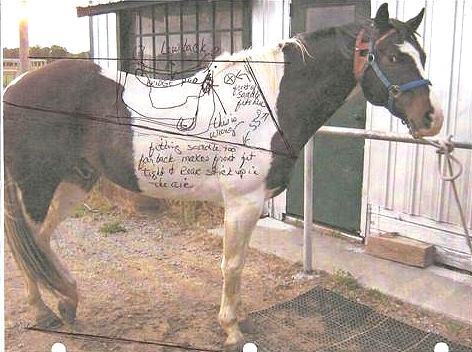 The entire western industry lags behind in helping with proper fit for these equines. Still several methods can be tried to fit this situation. You can use a smaller filler (or bridge) pad under your regular pad, buy one or cut up an old pad for this purpose. 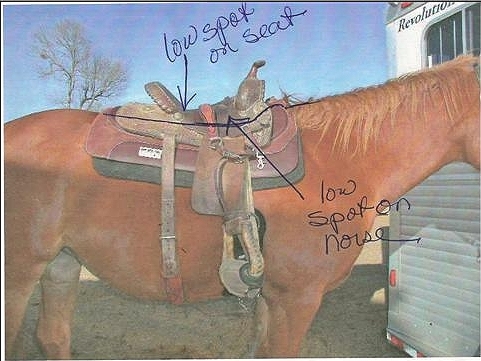 What you are accomplishing is making the back look “more normal” to fit your saddle “more normally”. I have also recently seen a pad by Supreme Western that actually look just like these backs and fit perfectly… made of wool felt too. The problem is that there is not a saddle that can fit that weird shape unless one were to take a narrow little saddle, fit it behind the shoulders in the low area of this extreme shaped back, which I know is the only alternative, especially on really old horses who were low to begin with but whose backs have dropped even more by age. Another method of normalizing the back is to fill the back without padding over the withers. This idea has been around for a long time. It is called a “cutback” pad. A shaped notch is cut to go around the withers with an arrester strap, usually of nylon webbing to keep the front of the pad from slipping down on the shoulder. The problem is… I have never seen a cutback that was done correctly. The cut out is never long enough to fit behind the wither. Because; remember, as the shoulder blade rotated forward, the wither doubled in length. You can take a cutback to a shoe shop or saddle shop to have the cut extended to the base of the rear of the withers. I have heard the most commonly used excuse for not using this type pad is that the rider does not like the its look—Who cares!! Pick a pad with care. P.S. We have recently, at no charge, designed a pad for Diamond Wool which works good. When you saddle a horse, the front of the saddle has to fit on the shoulder not behind it. Stand at a show, watch 100 saddled horses go by and at least 75% of these are saddled wrong. Most saddles made have trees in them that do not flare open in front, widening to sit on the shoulder. This is not a reflection on the saddle maker but the tree makers. Also because the wither area is much longer in a high withered horse, unless you have trained yourself to check proper placement ones natural instinct is to place too far back - where it would sit with regular shoulder angle. Now we can get to dry spots. Dry spots are never right in any size, although there are times when you will not be able to get rid of them. If they are in the dip behind the shoulder they are either because the saddle is sliding backwards or the rider has put it there. The front of the bar of the tree is pressing on this spot and the rear end of the saddle is jacked up in the air. Then it is pressure causing this spot and steps have to be taken to fix this. However, in the last few years I have seen a few whose trees are staying up on the shoulder and fully forward as they should be; then the spot is caused by lack of contact. Since there is no pressure the saddle is floating over this area, so naturally with nothing touching here, there are no sweats points. First though, let us check out where these areas are. When the saddle is BEHIND the shoulder instead of ON the withers (this is the same as being behind your shoulder blade) it causes pain and restricts movement, especially while turning (such as around a pole or barrel). Dry spots are caused because the front end pressure of the saddle is much greater than the rear end due to the rigging being closer to the front end of a saddle. This constriction will press so hard the skin can not breathe or sweat. Later this can evolve into white hair patches, easy to see. I have never seen these on the withers, they are always behind the wither. Try this; cinch the saddle up tightly as you would like. While standing beside the horse, try to fit the fingers of your hand under the saddle skirts front edges between the pad and saddle, starting up at the top near the withers and go all the way around to the hips. If your saddle placement is wrong, you will not be able to work one finger under at the front, but the rear of the saddle will be so high in the air, you can shove your arm under the skirts. This is dead wrong. Correct it by un-cinching and moving the saddle forward until front and rear has equal pressure. If you can’t cinch with the saddle placed properly because the front rigging hangs over the horses shoulder instead of behind his arm then the rigging of the saddle is too far forward. Have a good saddle maker move the rigging back or get rid of the saddle. This rule of fit is a universal truth. It is true for all horses and true for all saddles. Even a saddle that is too narrow will benefit from correct rig placement. Be aware that regardless of what you try; because of the extreme shape of the shoulder and low backs on some very fast animals, there are going to be some animals that even with a custom fit, dry spots of some size are going to be a problem. Although with thought and work, padding can be adjusted to make most saddles work on most horses even if the fit is not perfect. SADDLE PLACEMENT....even the right saddle placed wrong won't work. There are now six trees for contest/event saddles for barrel racing and pole bending. I do not wish to confuse with a larger number, so I am going to divide these into 2 groups. 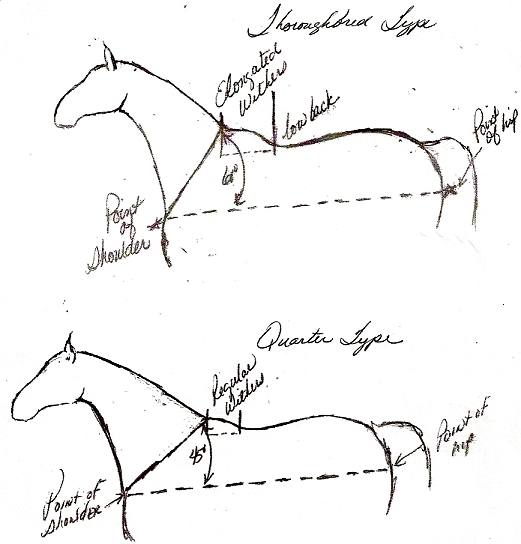 The main difference in basic body types is: (1) the Extreme Back…these started with Thoroughbreds, straight shouldered high withered, low backed. This is a back with a lot of contour so the trees have to have a lot of twist and a lot of flare to fit. (A) TG Racer™ is the narrowest, fitting young underdeveloped animals or the old Appendix type slender with sloping shoulders. (B) Rocket™ is a great saddle for the same contoured back but that is much wider with larger or bulging shoulder blades. (C) Ultra Rocket™ is our newest extreme type for the very largest, widest, most contoured; not a lot of these yet but we saw the need. The other type of back started with the cow-bred horses; a flatter and lower withered horse. This level back needs a less twisted and wider sprung bar to sit as flat. The narrowest of these are the (D) Pro Racer™. Good for a lot of young animals or ones hard to fatten. (E) Pro Max™, our most popular wider, flatter tree, works for full bodied horses with large shoulders. (F) Maxed Out™, the same tree but even wider. We cannot believe this tree and the Ultra Rocket have been necessary but the industry is breeding larger and wider horses every year. 2% of the sales today are for the TG™ and ProRacer™ with a 7" gullet. This is due to young horses being so much larger. In 2009, this figure was 20%! Now, there are a lot of these trees still out there due to the fact that until 2005, these were the only trees we built for barrel racing. They are still used, traded,and sold although most are used for training as they are mostly too narrow for finished horses. The Rocket™ and ProMax™ which prior to 2015 have held 70% of the market, are now down to 38%. In the past, 7 1/2" gullets have been considered the "standard" for normal horses. Normal now is an 8" gullet like the UltraRocket™ and Maxed Out™, which hold 50% of the market share. The remaining 10% are allocated to the XL's (8 1/2") or XXL's (9"). These are available in both UltraRocket™ twist and Maxed Out™ twist.